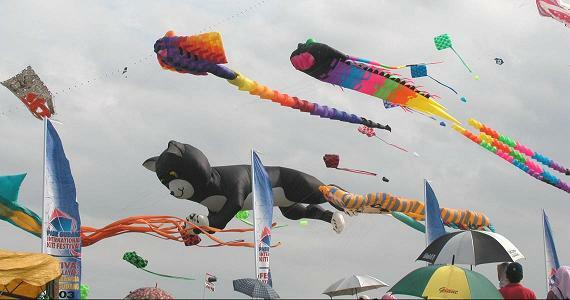 14th Family Kite Festival, Lunen, Germany. Attended by Gadis. The American Chamber of Commerce in Singapore Community Day. 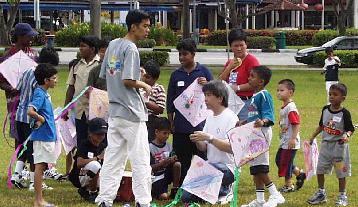 Together with United Technologies (UTC), it was a morning of kite making and flying for 50 children from Jamiyah Children's Home and the Salvation Army Haven Children's Home which was held at Pasir Ris Park. U.S. Ambassador to Singapore Franklin L. Lavin graced the event. Shakib, the story teller made an appearance with musical instruments and magic tricks. Attended by Peter, Stephanie and Gadis. 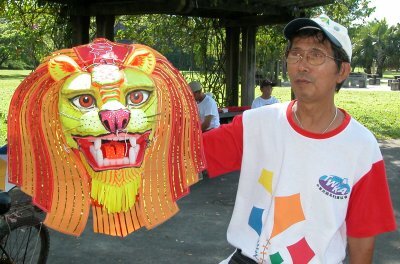 held at Pasir Ris Park and organised by Ernst & Young. with story telling followed by flying of of miniature paper butterfly paper kites. We conducted kite workshop at Feed Me! 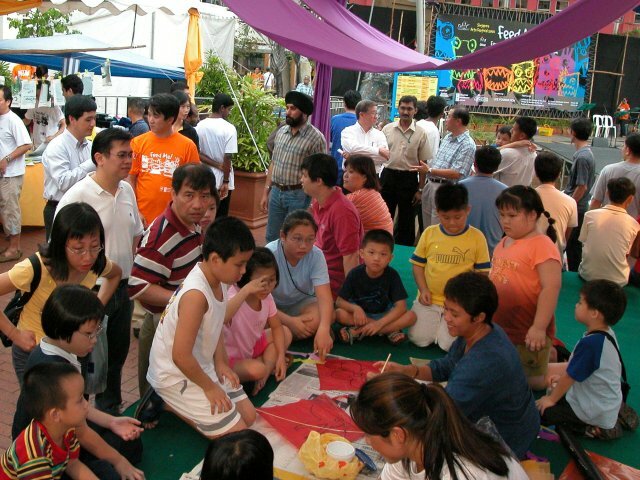 Toa Payoh Mayor Mr Heng Chee How (top left) gracing the kite workshop session. 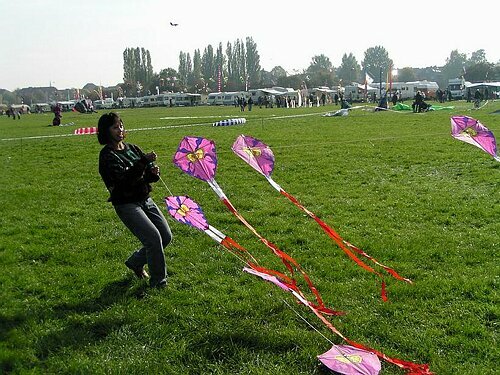 1st PERLIS OPEN ASEAN KITE FESTIVAL 2003,at Stadium Kangar,Perlis,Malaysia. at 7.15 pm. There will also be other activities. Come on out and join us for an exciting evening by the river! 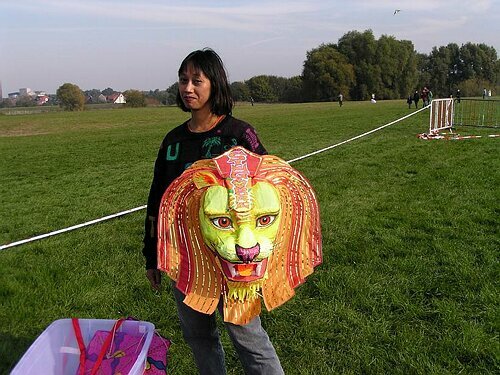 International Kite Festival. 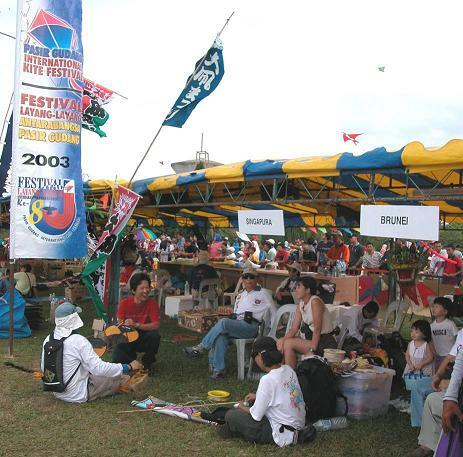 This event is on 25-27 July 2003. Migrated the entire SKA website to a new location. 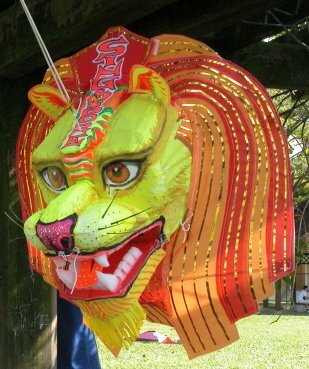 The Merlion kite made it her first public appearance at Pasir Ris Park today. We are now making adjustments to for the Merlion train to fly in strong wind. has been cancelled due to SARS. 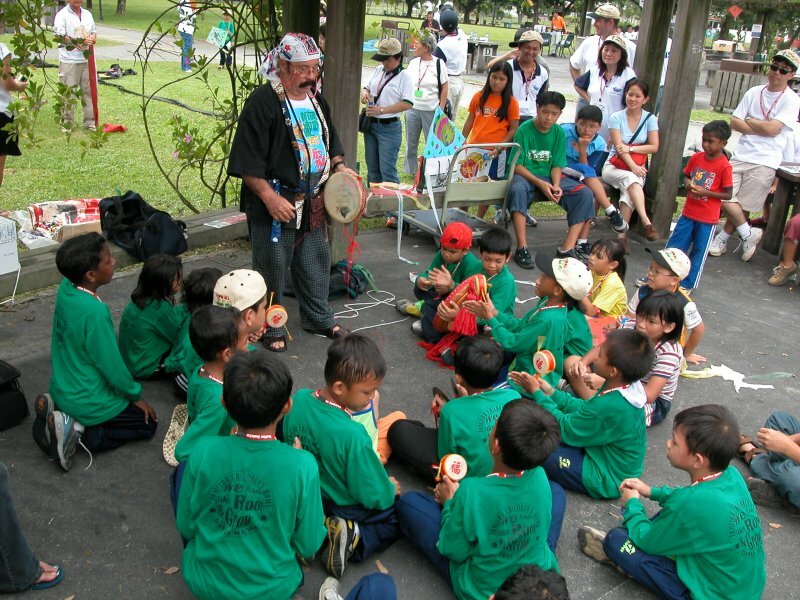 CHILDREN ASSOCIATION at Pasir Ris Park at 10AM-12PM. flying session was interrupted by heavy shower. SKA Kite Day. Plenty of rain, many did not turn up due weather. Kite Flying for families of SINDA at Pasir Ris Park. 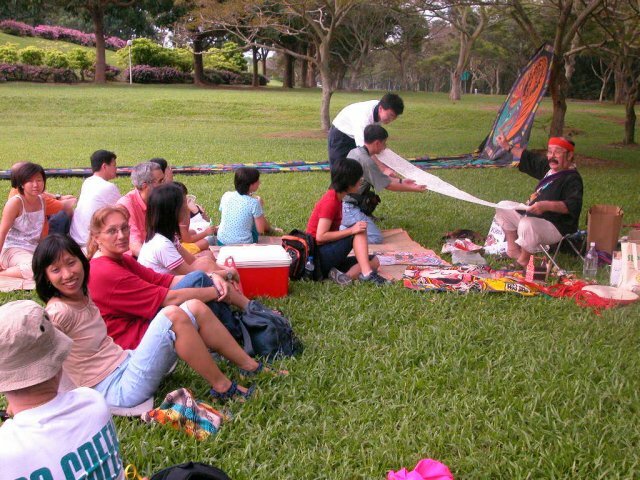 Sport Kites demo & kite making workshop for MENSA members at Pasir Ris Park. Finally Wing Lee met up with Angela Wu (TWKA) in Taipei Grand Hyatt. Tan Poh Wah putting finishing touches to the SEC green kites at the carnival. 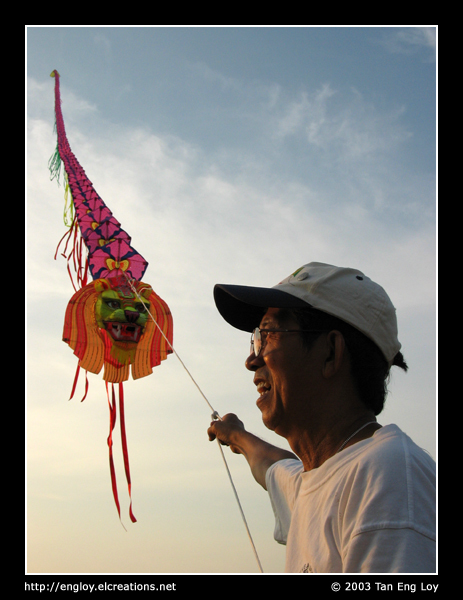 4 SKA members are off to Qinhuangdao International Kite Festival 2002, China. fill the sky with dragons. Here are some pics. Tan Poh Wah's white & red dragon against Pan Pacific Hotel. Marina Promenade / Marina Bay from 15 Jun 2002 to 16 June 2002. SKA conducted a kite making workshop at SINDA HQ. below 150m on 15 and 16 June 2002 from 1 pm to 6 pm. to be aired on KIDS CENTRAL for next 6 SATURDAYS 1:30-2:00 PM which premiered on 13 April 2002. Finally, the Turtle Edo was seen in the air for the FIRST time. 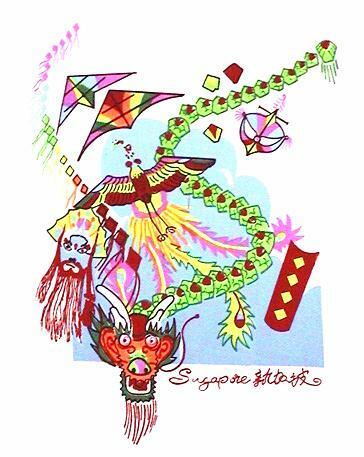 Really Something, Episode 13 : Exit the dragon was aired on Channel i.
Singapore Dragon Boat Festival 2002 from 15 Jun 2002 to 16 June 2002. Makan for Gary & Michelle from the Toronto Kite Fliers on their visit to Singapore. be featured in the last episode "Dragons"
So don't miss out Really Something on the second week in April. 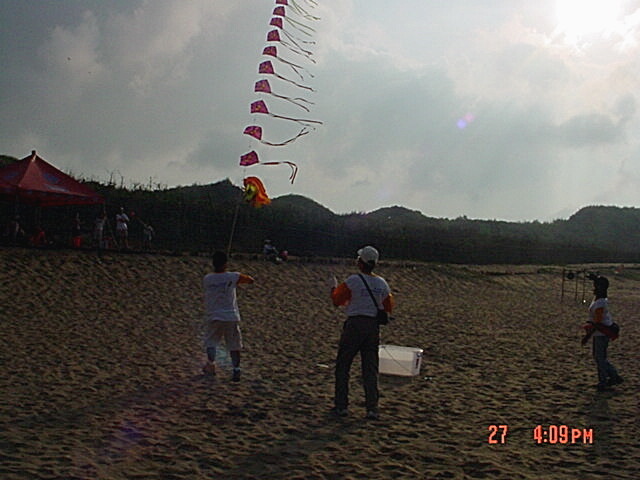 The Turtle Edo Kite was seen for the first time at SKA Kite Day on 24 Feb 2002.
were made to the bridle before the madien flight. Many visitors have requested that we elimiate the "_" or "underscore" in our URL. The webmaster has just returned from Pasir Gudang. However, you'll need Acrobat Reader to be installed. Group photo of the Rokkaku warriors before the battle. Site inspection and madien test flight for JTC Rokkaku. 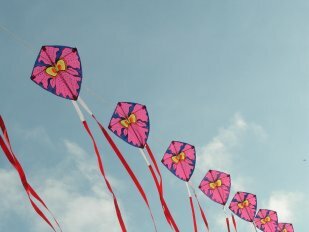 DOES DIET AFFECT KITE FLYING PERFORMANCE? At least one member is now taking pegaga, noni and linghzi to extend shelf life. We are getting into gear to assist with SINDA Kite Flying for children. Kite Colouring Competition & Flying for children. Podium B, SINGAPORE - from 7 Sep 2001 till 1 Oct 2001. 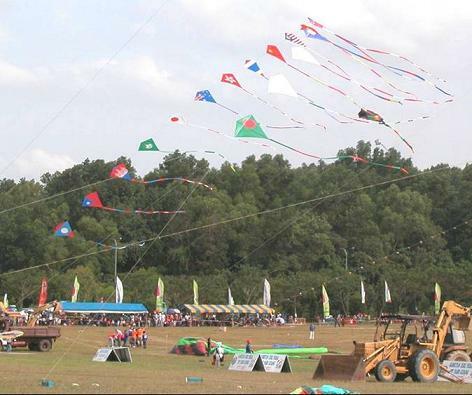 Started ASIAN KITE DIARY for recording of Kite Events in the ASIAN REGION. SKA introduced a new Tee Shirt. Graphics by Robert Foong.